Last week we started looking at a handful of ways to be healthy and started with the thumb. This week we are moving on to the pointy finger! 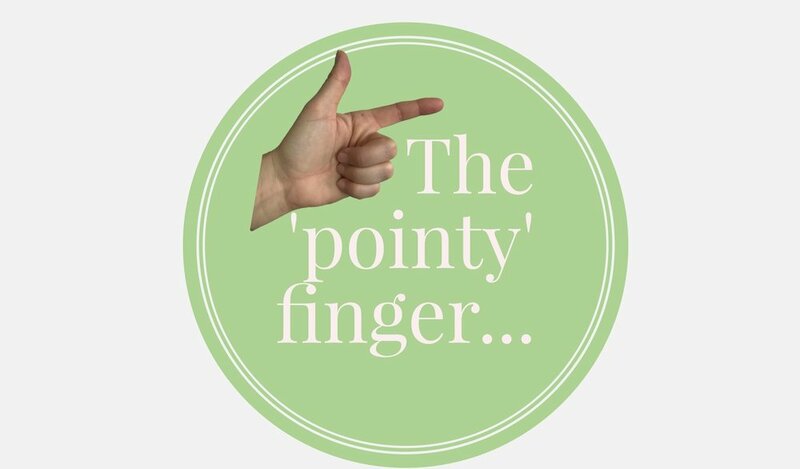 For clarification - I’m referring to the pointy finger as the finger we use to point towards others. It can seem like we are pointing to others when we look to them and expect them to help fix, or do something for us. It can also apply when we think it is entirely their fault that we are in this situation. And whilst there may be a degree of truth in that at times, we can easily forget that when we point, there are at least three fingers pointing back at us! Pointing, blaming, or expecting others to do something that we are meant to be owning or taking at least part responsibility for ourselves, can result in disappointment, frustration, mixed emotions, confusion, and a genuinely poor level of health and wellbeing. Here are some examples (taken from the new year quiz!) of when you might be pointing the finger expecting others to do something. See if you can identify with any of these* situations and fill in your blanks…..
….. never puts the lid back on and it makes me cross. The ….. never makes it easy for me to spend more time in the garden so I never get round to planting my herbs. ….. needs to make a phone call before I can…..
The….. washing/ironing/cleaning/cooking/phone calls/kids/….. needs doing before I can make time to ….. He left the….. And I couldn’t….. When ….. then I’ll be able to ….. The temptation to ….. is always there and I can't resist. OK, so those are just a few scenarios that you may or may not be able to relate to, and whilst they may even be truth, it might be helpful in reducing your stresses and improving your wellbeing to look at the three fingers pointing back at us when we are pointing the finger at others or our circumstances. Owning what's in our responsibility rather than looking to others to fix us is key to making changes, and is a critical part of our emotional health and wellbeing. No matter how much we want other people to help us along our journey, or help us solve our problems we are never going to make any change unless we start with looking in the mirror. Change or transformation starts only when we acknowledge the need for change. And that also applies to those we see who we believe need to change, but don’t see it in themselves. Understanding what our responsibility is and what it is not, what is in our control and not someone elses responsibility, and then excepting that and owning that, is the key to being emotionally healthy. Admittedly, this is hard and requires humility. In pointing to others we need to also look at the 3 fingers pointing back to us, and be open to the fact that we might not always be right, that our way might not be the only way of thinking, or that we might even be wrong. This is hard, requires vulnerability and not something many of us are used to or encouraged to do. However, from someone who is learning to be more open to this, I have learned it is incredibility liberating to not have to always be in control, my relationships with others improve and it’s great for my health and wellbeing. So this week if you find yourself getting annoyed because nobody understands you, take responsibility for your part in that, and try and explain again in a different way. Or take a moment and try and understand what it is they don't understand so you can explain it again from a different perspective if it seems really obvious to you. Accept that whilst others can help us, it is only when we take responsibility and take the first step of our own lives that we can begin to see transformation. God has given us all a living body and we are better in community when we have support and encouragement. But we can’t expect that to happen until after we have taken ownership. Next time you find yourself looking to someone else, are frustrated that someone else isn’t getting it try and remember that as you point the finger at them, there are at least 3 pointing back at you! whether you believe in God or not, excepting what you can change and surrendering what you can’t, and having wisdom to understand the difference is incredibly helpful for your emotional health well-being. If you want to take ownership and start on your journey towards being more intentional about your health then why not download our FREE Intentional Health journey workbook by clicking the picture below to help get you started on your journey to living a healthier, happier life. And as always, if you found this post helpful, please share it so others can benefit too!